Can saler is a generously proportioned country house with gorgeous views to the Mediterranean sea, Ibiza, and Es Vedra. This is the perfect location to watch the fantastic sunsets, and is conveniently located for sunbathing at Cala Saona, swimming at Punta Pedrera or shopping in San Francisco. Located in area of Porto Saler, and sitting on a good sized plot of 1.5 hectares, this villa is relatively new, having been constructed in 2008, and provides great access to nature, with wooden walkways around the plot and benefiting from its own small forest. Can Saler is the ideal villa to entertain guests as it has a nice balance of indoor and outdoor living areas, with excellent dining areas inside and out including an outdoor chillout area which is great for afternoon siestas! Can Saler has a modern feel with contemporary decoration throughout, making for light and airy rooms that are a pleasure to be in thoughout the summer months and indeed during winter. There is a superb kitchen diner with quality appliances and large rustic wooden table, making it a great space to entertain or dine in, or use the table outside for a relaxing al fresco meal. There are two family rooms inside the house, each with TVs. One of these rooms is upstairs and can be used as a fifth bedroom with a double chaise lounge and it has its own bathroom and an amazing terrace/balcony with great views to Ibiza and the sea. Can Saler has 4 generously sized bedrooms & 5 bathrooms plus a separate toilet. In the main house you have one double bedroom with ensuite bathroom, one bedroom with 4 beds (2 sets of bunkbeds) which are great for kids, and one bedroom with 2 single beds. These two rooms share one bathroom. There is 1 further self contained bedroom suite with bathroom and own garden area which is located outside of the main house. The house has cable/satellite TV, Wifi internet connection, Air conditioning & a stereo. This large villa is great for families looking for a Formentera villa rental as it has separate bedrooms outside the house. There are two more double suites each one with a full en suite bathroom and their own backyard. The villa has ample outdoor space, making it ideal for chilling, dining or just enjoying the balmy summer nights. There is a dining area and two chill out areas, one is perfect for the morning and the other one for the afternoon. There is a new chillout area close to the pool for taking those much needed afternoon naps. The Garden is a very nice 1.5 hectares with wooden walkways around the plot & a play area. The swimming pool is without chlorine which is better for the skin & the eyes. Feel at one with nature in the outside shower, which is also lovely for keeping cool during the hot summer days. Please note: There is no longer a fence around the swimming pool shown in image 1 and is now more luxurious. 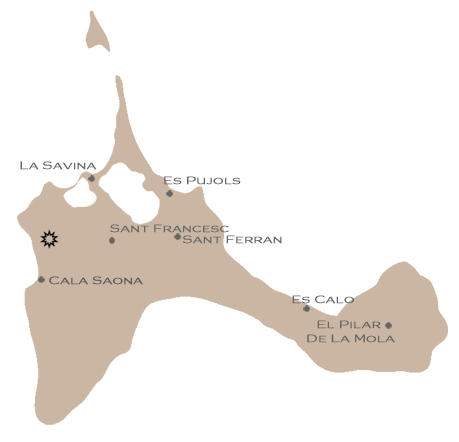 Can Saler is located in a secluded area but not far from the many bars, shops & restaurants of San Fransesc. The nearest beach is Cala Saona, being less than 10 minutes drive away.